The fabric of the Museum’s history has been woven by many people. A few add a strand or two of color, while others provide the very warp that holds it all together. Unfortunately, there comes a time to say good-bye to some of these people. We are grateful for them, and we will miss them. Ed Everts was a dear friend and instrumental in turning the Birds of Vermont Museum into a reality. He provided the initial funding that allowed Bob to start carving. Ed, and his partner Raven Davis, are remembered not only for their support, but also for their friendship. In addition to all he did for the Museum, Ed was devoted to his family, spreading peace, working with the Peace and Justice Center , and exploring the world (sometimes with Bob and Gale in a VW microbus). Mary Fell was a resident of Underhill. In addition to time spent volunteering for the historical society, she was a dedicated volunteer for Meals on Wheels and also volunteered many hours at Audubon Vermont‘s Sugar-on-Snow parties. The General Assembly of Vermont wrote a resolution honoring her for her work. Her friend, Carol Wagner, is spearheading a campaign to dedicate a bench to Mary. The bench will be placed in the gardens along the path to the treehouse. Hub had personal ties with the Museum through his connections to Bob and Gale. He and his wife, Marie, were two of the Museum’s charter members. He had a close personal connection with the Museum’s mission of conservation. Hub worked with Bob and others to preserve Vermont ridgelines and mountaintops. Hub was a botanist whose groundbreaking work on Camel’s Hump led to national attention regarding issues with acid-rain. 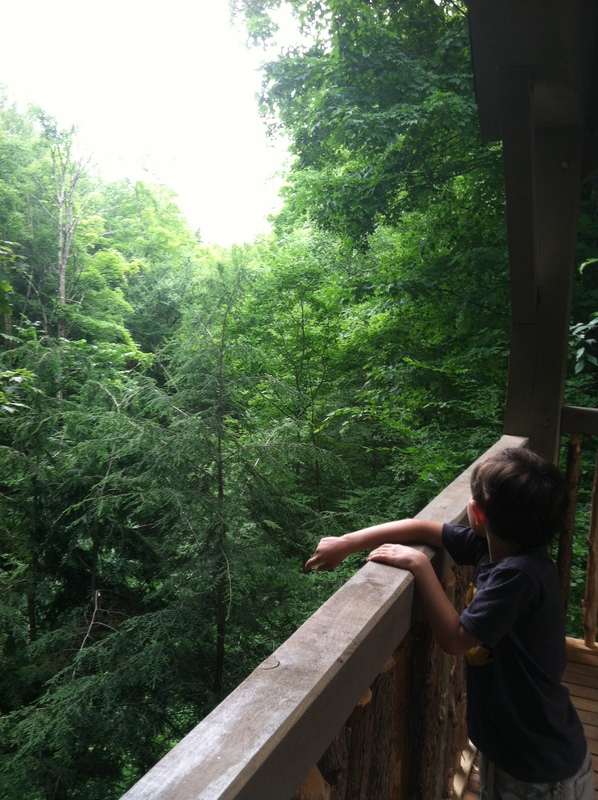 He also co-founded Vermont’s chapter of the Nature Conservancy. In addition to serving on state and national environmental boards, he served on the Museum’s advisory board. A slightly different version of this post appeared first in our late summer 2014 issue of Chip Notes. As you may recall, we “took advantage” of the devastating flood, integrated that with several pre-existing hopes and plans, and coordinated an initiative we call Bridges to Birds. This four-fold project will make (and already is making) the Museum more accessible to all, indoors and out, enabling better and more bird conservation, environmental education, and appreciation of Vermont’s natural communities. 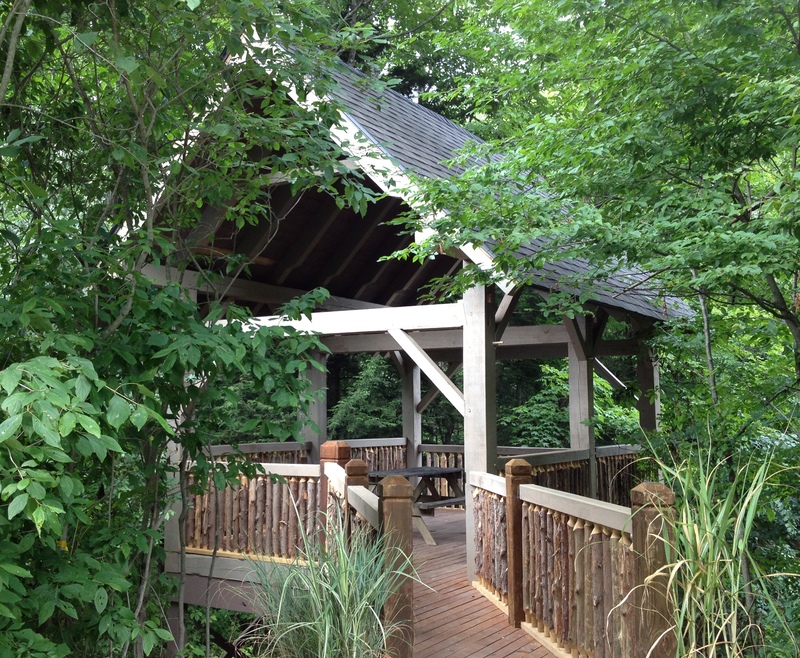 One phase of the Bridges to Birds Project, Connecting to New Perspectives (the Treehouse), was completed this summer, and you can read more about it elsewhere in the blog. Two other phases, Connecting to Nature (with Interpretative Trails) and Connecting to Conservation (with Bird-friendly Gardens) are actively underway, thanks primarily to several dedicated volunteers and interns. Now we focus our attention on another phase: Connecting to People (the reconstruction of our parking-to-entrance access). This one is perhaps the largest endeavor, and you’ve probably seen and read about the planning, engineering, and design aspects already in previous issues of Chip Notes. Early in August we heard the great news that in the next few weeks the town of Huntington will replace the culvert that funnels the water from the creek above the Museum, under Sherman Hollow Road, and down to “Bob’s Bridge.” This is an essential prerequisite to our own construction process. Once this culvert and Sherman Hollow Road have been repaired, the Museum can start the physical repairs to create a safe passage for visitors from the parking lot to the Museum doors. While waiting for this construction to start, we all have been learning and researching ADA laws, erosion prevention techniques, effective interpretation methods, and the ways entrances can shape and enhance Museum-going experiences. We have also been consulting with designers and engineers, writing grants, and working on other fundraising to bring this phase into reality. Vermont Community Foundation’s Special and Urgent Needs grant helped support initial personnel time (staff and consultant) as we began the planning and design of both temporary and permanent measures to bring people safely to the Museum, and storm water through the property ($5000). Museum members and community donors help pay for some of the additional staff time as we continue to plan, apply for new grants, and develop related presentations and literature. Some of these donations will go directly to the initial construction costs ($7000). We also recently received a grant from the Vermont Better Back Roads program to address stormwater runoff, preventing damage in the future. If you have seen the photos of the parking lot, or stopped in recently, you know from your own experience how essential this is to protect the riparian habitats along the tributary creek and Sherman Hollow Brook. We are about to embark on a fundraising campaign for the bulk of entrance-access construction. These costs are great. There will be costs for detailed plans and oversight from structural and civil engineers, the site work, bank stabilization, stream bed restoration, the ADA-compliant bridge and walkway construction, materials, and interpretation. One member has already promised to match all donations! As space here is limited, look for another mailing with more information about the entire project. 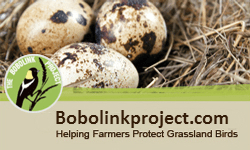 It will include detailed goals for each phase, costs, donation information, and a generous list of thank you gifts, from watercolor prints by Libby Davidson, to a very special one donated by Denver Holt, renowned Snowy Owl biologist. Thank you to all who have donated so far! We will continue to post pictures as progress is made. This is a very exciting time as we not only repair what was damaged but create a fully welcoming space that connects people to the essential and exciting world of birds. We happily accept donations online through JustGive, NetworkForGood, and PayPal. Or use the phone or address below. Renew yours, become a new member, or give a gift membership to a bird-loving friend or family member. Use our online membership form (PDF). Opportunities abound! Our Volunteer page has more info. Use your everyday choices, from the coffee you choose to the laws you enact, to create a world better for birds. Tell people about us with travel reviews, in your blogs, and in your photos! ​Please come to the Birds of Vermont Museum for Volunteer Work Day! On Saturday, April 26, from 9am – 2pm, please help prepare the Museum for the open season. From trail work to hanging art, we have opportunities for all. Come for an hour or all day, bring yourself, a friend, a family. All welcome. If you can’t come this day, please consider a couple of hours, a day, a weekly rotation, or something else! Whether you are out in the meadow, helping visitors at the front desk, or deep in the office, we would love your company and assistance. We train, too. Got some time to volunteer? We’re looking for you, whether you have an hour, a day, or a week. Take a look at the days of needs below, and let us know if you might be able to help on one or more of these days. Note: There’s always a staff member or very experienced volunteer with you if you’re new, no one needs to work alone! Also, these time slots are suggested; we will happily work with your schedule. 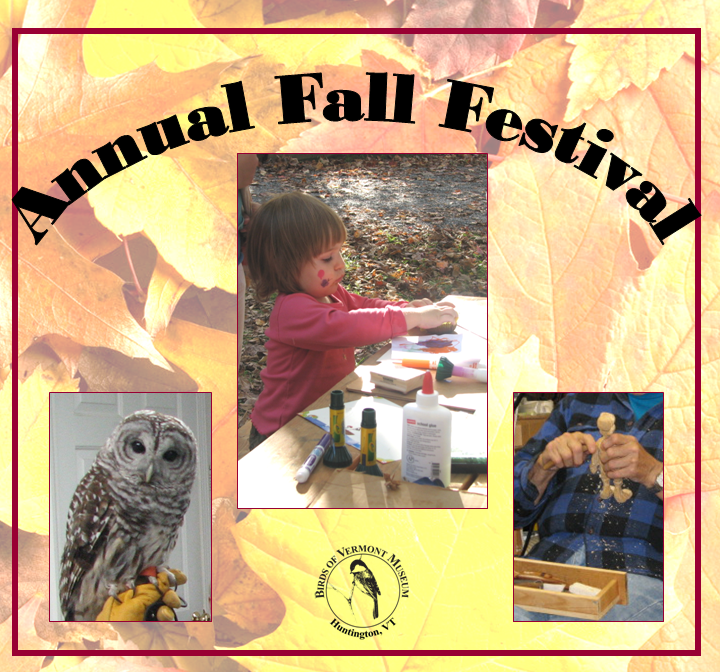 Saturday, October 13 • 10 a.m. – 4 p.m.
Live birds, music, soap and wood carving, kids’ crafts, face painting, and more!